Welcome to the 17th episode of the DFB Podcast! In this episode we cover the latest Disney Food News; discuss AJ’s and Brad’s dream Disney meals at both Disneyland and Walt Disney World; answer some listener questions; and reveal the answer to our Episode 16 trivia question and reveal a new one! For this episode’s main segment, AJ and Brad discuss their dream meals at Disneyland and Walt Disney World — if they could cobble together their favorites on each coast, what would that meal look like? AJ and Brad each choose an appetizer, an entree, and a dessert from Disneyland and from Walt Disney World! Debbie L.: I’m going to Disney World for the first time during Christmas week. What restaurant do you recommend for a holiday meal? Keith F.: What are the two best snacks in Epcot? Name two of the Disney restaurants that have a character meal for breakfast only. Send your answer to trivia@disneyfoodblog.com to be entered to win a Disney Food Blog Dining Guide e-Book of your choice! 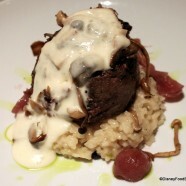 About the Picture: The Mushroom Filet at Le Cellier steakhouse: AJ’s favorite entree! More Disney Holidays! The holiday season at Walt Disney World is here! The extra festivities can be overwhelming, but by pre-planning, you’ll be able to choose the events, shows, activities and meals that are most important to you and create a strategy to make sure you experience them all. You can do so with the DFB Guide to the Walt Disney World Holidays 2013 e-Book! Listen to the podcast for a special promo code to save on this guide and download immediately to plan your holiday vacation. I need a suggestion. I’m going to WDW Jan 23rd for one night, and am transferring to Universal the next day (my birthday) for the Harry Potter weekend. I am in my 50s and will either be by myself or with a friend. I don’t want to pay for a whole day’s park admission for just a few hours, and am afraid to make reservations because – what if the flight is delayed? Can you recommend someplace good for dinner? Staying at the Boardwalk. How about breakfast on my birthday? Thank you for your help. Anyway, cool idea to ponder. Great show! Cheryl D. — Our favorite is Flying Fish on the Boardwalk — well worth it! Other possibilities to try in that area for dinner: Yachtsman Steakhouse and Beaches and Cream in Disney’s Yacht and Beach Club Resorts, and Bluezoo or Il Mulino at the Swan and Dolphin close by. For breakfast — definitely get the cinnamon roll at Kouzzina! Keith — Awesome day of delightful food!! I still haven’t tried the mac and cheese at Flying Fish; hope it’s on the menu on my next visit!